23mm stainless steel case with integrated cable. Stainless steel bezel set with white diamonds. Sapphire crystal with double-sided antireflective coating. Water-resistant to 1 ATM (10 meters/33 feet). Applied Roman numerals and diamond markers. Stainless steel curb chain bracelet with fold-over clasp. 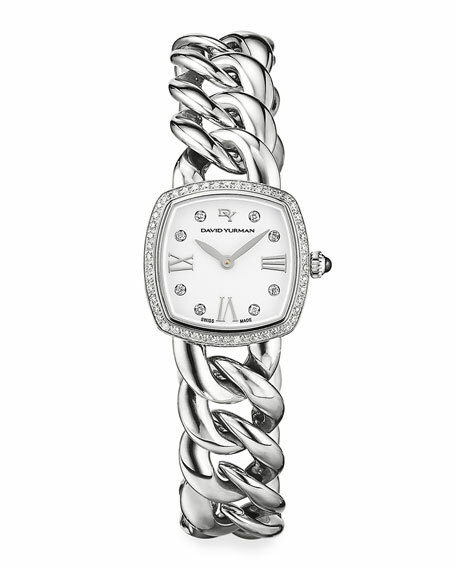 David Yurman watch from the Albion Timepieces Collection. Leather double-wrap strap with stainless steel buckle. Beveled stainless steel case. Sapphire crystal with double-sided antireflective coating Roman numeral and diamond stud hour markers. 0.06 total diamond carat weight. Two-hand movement. Logo crown detail. Imported.